As audience members awaited the evening’s speakers, they first heard the 911 calls dispatch also listened to the evening the Lake Christine Fire blew up this past summer, followed by still images of its furious flames, devastating destruction and the first responders, countless volunteers and the community it brought together. “Few who lived through the Lake Christine Fire will ever forget it,” forum moderator and former Mayor of Aspen John Bennett said at the beginning of the event, referring to the fire that burned more than 12,500 acres north of Basalt and cost over $18.5 million to fight. The first speaker of the evening, White River National Supervisor Scott Fitzwilliams, said it wasn’t the Lake Christine Fire’s eruption during this extreme fire season — the result of illegal tracer rounds being fired off at the Basalt gun range — that surprised him. It was the fact that only three homes were lost, considering the severe situation on the ground, he said. 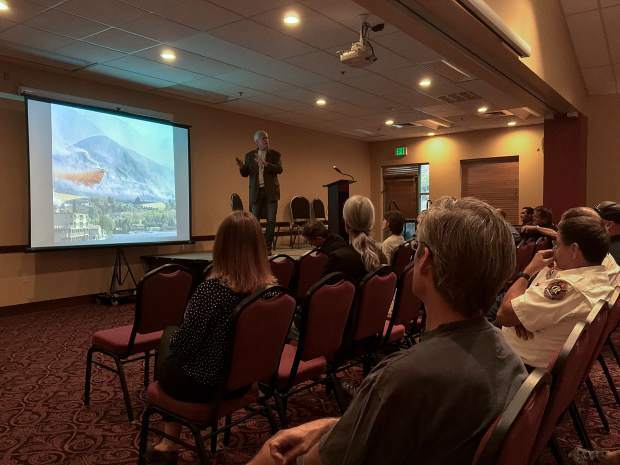 National Geographic science writer Gary Ferguson, who recently authored “Land On Fire: The New Reality of Wildfire In The West,” echoed Fitzwilliams but also went on to describe how thousands of years worth of fires actually produced a lot of the beauty the Roaring Fork Valley displays today. However, Ferguson quickly discerned the difference between the routine fires of the past as opposed to the 200-foot tall flames and 2000-degree temperature fires which have become the new norm. Ferguson presented rigorous scientific numerical data and thermal geographic images, but also detailed how simple mitigation techniques also go a long way. Basalt Fire Chief Scott Thompson also took to the podium, adding, “The nightmare happened to me this year,” describing how, without the help of other local fire departments, national hotshot crews and volunteers, who knows how the Lake Christine Fire could have played out. “We need to work with our politicians,” Thompson said. But he added that personal responsibility as it pertains to fire mitigation should be at the forefront of every Roaring Fork Valley resident’s mind. Pointing at a picture of El Jebel which showed a charred mountainside on the left next to a community still alive and intact on the right, Cupp, who made life-or-death decisions the night El Jebel was in dire danger, said had it not been for the key communication between firefighters and law enforcement that picture would look tragically different. The Changing Face of Wildfire held a forum Tuesday in Basalt, and will finish the series of forums Thursday night in Aspen, from 5:30-7:30 p.m. at the Doerr-Hosier Center.